At Qualfit we can supply and fit sectional garage doors â€“ highly recommended for safety, security and insulation, and available where you are in Worcester, Malvern, Evesham, Pershore, Droitwich, and beyond. This clever design combines the ease of operation of the roller shutter with a less industrial look, and high performance for security and energy efficiency. Security-Â Each section of the sectional garage door locks in as it is closed ensuring that the frontage, once in place feels 100% solid and secure. Insulation -All our sectional doors are optimised for warmth with a foam filled core providing full insulation, and sealed runners â€“ guaranteed to keep the weather out of your garage. Safe operation -Â Because each section of the door has at least one roller inside a metal channel this design ensures a smooth, controlled, and safe operation. 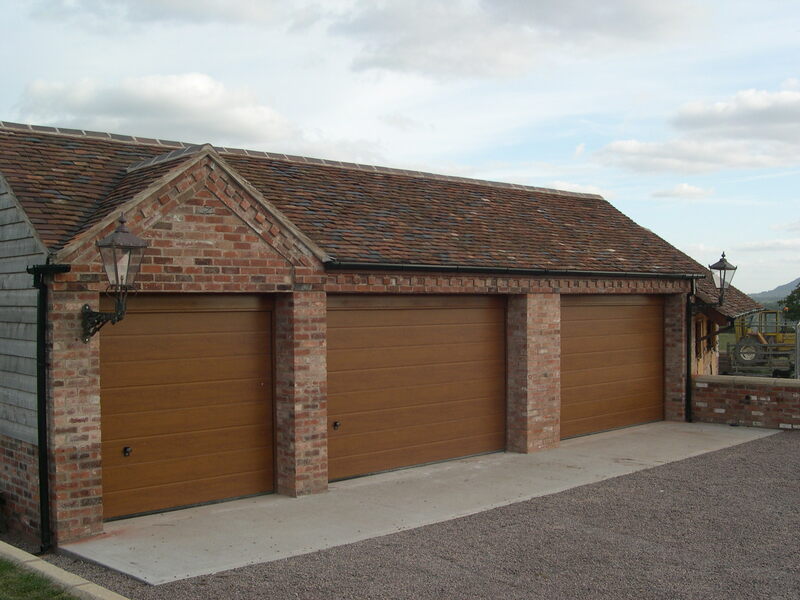 Sectional doors are a good option for garages with low entrances, or with tight driveways, and with expert installation can provide unobstructed drive-width too, as the frame can be fitted behind the existing doorway pillars. At Qualfit Garage Doors we have specialist installers to make sure the fitting of your garage doors goes without a hitch. We take care to ensure every customer is completely happy with the performance of their Qualfit garage doors before we leave. Qualfit have an excellent range that we can supply and fit. This includes up and over, side hinged, roller shutter and other types of door â€“ all available with our expert installation service. In addition to our technical expertise we work hard to deliver a consistently high standard of customer service. Get in touch for more information about new garage doors, or garage door repair â€“ we are happy to offer a free initial site visit and consultation, and a no-obligation quote.